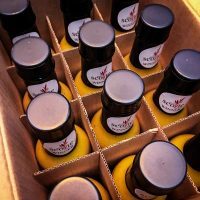 Home Brew Chef and Humboldt Hotsauce go for their second lap together, with this fatalii chili pepper injected super-food. A combustible combination of ginger, lemongrass and coconut milk that gives torque and traction to the hoppy Bear Republic Brewing Co. Racer 5 IPA. Turbo-charge your next meal by adding Yellow Thai Racer. Check out our recipe page! 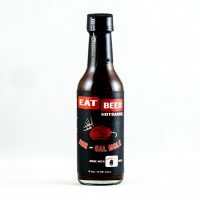 Eat Beer Hot Sauce’s are great hot sauces that provide a lot of flavor and good heat. They don’t overpower what you’re eating, while still bringing life to the dish. I’ll preface this review in that while I’m an amateur in the world of hot sauces, I taste beer for a living and thoroughly enjoy sensory. The first time I tried Yellow Thai Racer was on a piece of fresh baked bread. I don’t usually eat hot sauce on bread, but it turned out to be an excellent vessel for this since it gave me the chance to experience the hot sauce on its own. My first thought when I tried it was, “calling it a hot sauce does not do this justice!” This is an incredibly complex, yet approachable, hot sauce. 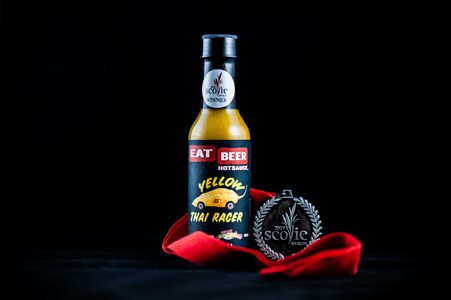 With a medium heat, Yellow Thai Racer has a pronounced spice to it that lingers on the pallet and morphs over the course of 10-15 seconds. It’s a pronounced heat, but never comes close to being painful or uncomfortable like some other hot sauces I’ve tried. The curry spices in this sauce add so many layers of flavor that it almost transcends what I think of when it comes to using hot sauces. It’s also made with Racer 5 IPA (awesome beer) which gives it a really nice light bitterness and I think adds some tropical and floral undertones. I’ve found that this can easily turn a boring meal into something fun and exciting. In the last week, I’ve enjoyed eating Yellow Thai Racer on pizza, grilled cheese, spam masubi, chow mein, sous vide chicken, a breakfast burrito, and eggs (over medium). Wow! 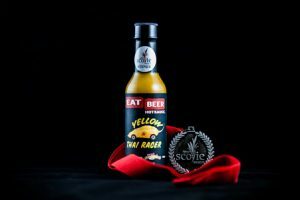 Eat Beer Hot Sauce does it again! Before I say anything I have to admit that Thai cuisine is my favorite. I love all the fresh citrus and herb flavors. I was excited for the release of this hot sauce just for that reason. After my first taste I was hooked. This sauce has all the fresh flavors you would expect from a Thai sauce, but the amount of fresh citrus will just blow you away. The use of the IPA is a great way to bring out that citrus. This packs enough heat to remind you that it is a hot sauce, but it is the fresh ginger, cumin, coriander, garlic and lime that really show through. I love this with fish, pork, chicken, eggs, tofu and shrimp. Often I simply mix it with a little olive oil and use it as a dressing for a mixed greens and herbs salad. Another amazing hot sauce. “Yellow Thai Racer” combines the awesome citrusy flavor and fire of Fatalii peppers, the hoppy goodness of “Racer 5 IPA” from Bear Republic Brewing Co., along with yellow Thai curry ingredients which include: ginger, galangal, lemongrass, garlic, turmeric, coriander, cumin, white miso, coconut milk, Makrut lime leaf, calamansi lime juice, kombu, and soy sauce! This is a bold and daring flavor profile that is spicy, floral, hoppy, citrusy, piney, bright, fresh, savory, and absolutely amazing! Ok. So, I’m not a professional reviewer nor am I an expert-level connoisseur of hot sauce. However, I know what I like, I love food and I’m moderately overweight. There. I said it. Don’t judge. 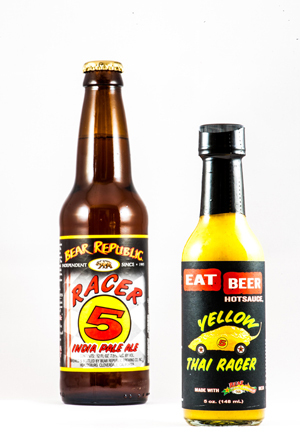 Yellow Thai Racer is, by definition, a hot sauce, but it’s also a versatile ingredient. The citrusy Fatalii peppers absolutely shine in this sauce! The combination of the aforementioned ingredients play perfectly together and complement anything you might put it on whether that be bread, or fish (Think: tilapia fish tacos with avocado), or my latest favorite, as an integral component of an awesome sandwich sauce!! 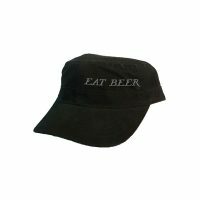 It literally goes with everything from eggs to chicken, farm to table. I’m not in a support group as of the writing of this review. However, I do find myself carrying a bottle around with me now, sneaking quick sips in dark alleys and behind parked trucks. Hot sauces are hot sauces are hot sauces. This is way more than just a hot sauce. This, is a masterpiece!! 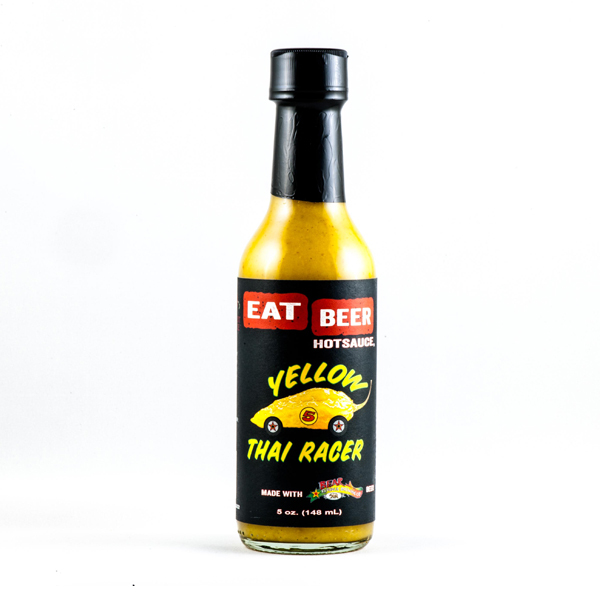 Yellow Thai Racer is not like most other hot sauces you’ve had. The Thai flavors really come through – first the lime juice is really bright and fresh, followed up by lemongrass and ginger on the finish, among with a low burn of fatalii chiles. I’ve got a good threshold for heat and spice so I don’t put this as a painful heat at all, more of a low, lingering, complex burn. The complexity of this sauce is terrific and I’m happy to have this in my rotation.